Push, rattle and roll with this 2 in 1 toy. 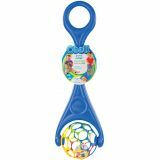 The O Ball easily detaches from the handle as a separate toy while a bead filled ball rattles inside. Assorted colors. 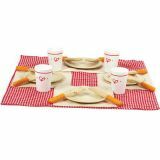 Ages 6+ mo. 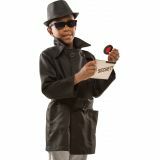 Super sleuths are equipped for top-secret assignments with this undercover role play set! The black trench coat and fedora hat are made with high quality fabric and sturdily constructed. Rear-view sunglasses allow detectives to see what's happening behind them! The secret coded message card, a decoder lens and a spy assignment guide challege their skills. 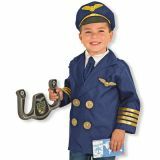 From Melissa & Doug for ages 5-8 years. 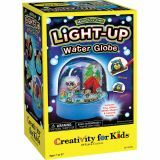 Create your own water globe that lights up! Just color the 15+ pre-cut shrink film shapes, shrink to fit inside your globe, add water and shake! Tools, glitter, sequins and colored pencils are included. From Creativity For Kids for ages 7+. The #1 card game about #2! 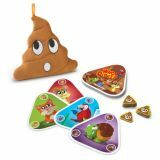 In this hilarious game, race to get rid of all your cards to avoid the blame of owning the animal that pooped. Each game is as funny as it is fast; quickly find your card, be the first to throw it down, and then blame someone else's pet! This new introduction to the popular Build A Road play sets adds double X tracks for twice the fun! 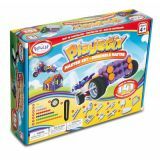 Over 11' of easy to assemble track, cross-over switches, tunnel and 2 battery operated cars. No tools required! 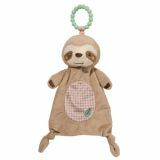 Sloth teether is 10" tall. This giant hauler comes loaded with six unique cars and unlimited play possibilities! The upper deck lowers to roll the racers off the truck. 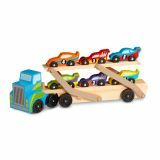 The cars variety of colors, designs, and numbers make for fun sorting and grouping in addition to racing! 30î long extended. Ages 3+. 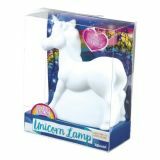 Portable, battery operated LED lamp.